UKENDOIT AND HAVE PIZZA TOO! 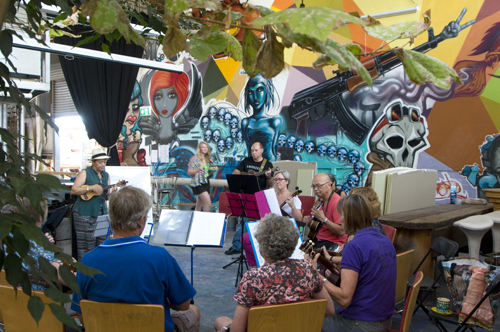 There are quite a few Freo ukelele groups and many more in the Perth metro area, so for all lovers of the tiny string instrument the Fibonacci Centre in Blinco Street should be the destination for Saturday night. UKENDOIT is organising a ukele jam of massive proportions. 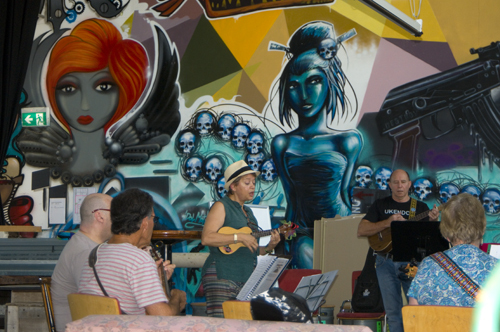 Various Ukulele groups from W.A. performing 8-10 songs. Pizza and Ukelele. What a combo! BYO wine, order a delicious pizza from the wood fired oven and listen to various uke groups performing on the night. Entry fee is only $ 5.00 to cover the rent for the space, so it should be a fun night that will support local creative talent and the Blinco Street Cafe, which is under the brilliant and ever smiling management of my mate Steph. Comments Off on UKENDOIT AND HAVE PIZZA TOO!